Human beings are animals; we forget that, with our Cuisinarts and camera cell phones. But human beings also need love, which is the highest function of our species. It is in this connection that we either fail or succeed; it is our vocation on earth. Reminder: Always check with the Vermont Studio Center on the day of a reading there, as schedules do change: 802-635-2727. Dave and I became fascinated with the work of Barry Moser years ago. We found his illustrations and design work accompanying the poems of Paul Mariani and Donald Hall; we tracked his children's book illustrations in Hall's gentle New Hampshire summer and winter tales, and spotted his craft on a Joyce Carol Oates book, then discovered (with leaping hearts) his darkly wonderful ALICE books, his WIZARD OF OZ, his DRACULA. We began looking for the scarcer pieces -- his Dante's PARADISO for instance. And keeping up with the new releases: this year's HOGWOOD, a tale told by master narrator Howard Mansfield and brought affectionately to life with Moser's pigs and people. I have been criticized, and will continue to be criticized, I imagine, for making images for the Bible that are too dark. ... And perhaps this is right, I don't know. But I do know that Paul (or Apollos) tells us there is no forgiveness of sins without the shedding of blood (Heb. 9:22). Faith, hope, and love may be the enduring message, but for me the over-riding theme of the Bible is blood and stone -- the blood of sacrifice and thes rone of redemption. It is the eternal and omnipresent conflict between good and evil. The tension between light and dark. Reading this for at least the third time -- as I've also read Moser's impressive collection of essays IN THE FACE OF PRESUMPTIONS -- I'm struck by the opportunity Moser's reasoning opens in this dark season of the world: that the presence of war and loss around and among us is not, then, a denial of the presence of God, but rather, evidence of the continuing labor by the forces of good, to redeem the disaster that falls among us. May it be so. Kingdom Books shelves a wide collection of Moser's work. I must confess that we've kept copies of nearly all his great work for our own shelves, too. To browse through what we're offering, please do visit the Kingdom Books web site and click on Browse & Buy -- which places you into our ABE listings -- and then type in the author slot, Moser. E-mail us with questions; this is work we love to discuss. I'm trying to catch up on some British authors this month, and just enjoyed my second John Harvey "novel of crime" -- this time, IN A TRUE LIGHT. To my amusement, it turns out to be a crossover with poetry, not in the form of verse, but in the sense of the poets and painters of the New York School, most especially Frank O'Hara as poet but also Jackson Pollack, Mike Goldberg (whose painting is shown above), and especially the biographical explorations by authors like David Lehman. The Cedar Grill occurs many times within the novel, which surfs a "current day" flood of consequences from a love affair between two painters that started in the Village in the heyday of New York jazz and the Beats movement. Harvey is a British author, and the book launches there, as Sloane, a forger of fine art, exits prison and wades back into his mostly soiled life. Way before the British law enforcement teams are ready, Sloane gets a summons from a woman he hasn't heard from in half a lifetime: expatriate artist Jane Graham. Racing to her deathbed in Italy, he receives her assertion that she once bore a baby girl, whose father is ... well, Sloane. Tangled among police teams, two sets of highly unpleasant and effective criminals (one in the UK, one in America), and a network of artists who haven't forgotten his early promise, Sloane is quickly over his head in complications. Harvey lets the plot threads show through, like streaks of color in a translucent fabric or on a wide stretched canvas being primed and receiving an outline. Sloane's goodness and generosity may be trumped by the determined criminals he's stirred up. Is jazz singer Connie Graham actually his daughter? If she is, will she believe it? By the end of the book, I felt as though I'd seen some of the paintings come to life, as well as the bohemian days and loves in which Harvey roots his tale. And it was a great delight at the end of the book, in the acknowledgments, to realize that Boston poet and biographer William (Bill) Corbett suggested the nucleus of the book, according to its author. Highly recommended for a summer read; it's a treat. The Art of the Book: Kingdom Books Celebrates! With the passing of the Stinehour Press this spring, and thus the local gathering place for typographers and book designers each summer, Kingdom Books has been at a bit of a loss on how to schedule the usual Fine Press Appreciation Day! But I don't want to give up our tradition, which was designed to overlap the gathering anchored by Rocky Stinehour. So -- we'll celebrate online this month, with some pieces to recognize this year's achievements in the field, as well as ongoing work by artists of the book. For readers who are new to the notion, the term "book arts" refers to the visual and tactile object of the book itself -- the way that the structure, pages, and exterior are designed to complement the interior text and illustrations. The idea is to "see" the book itself as worth attention. Nicholas Basbanes has been writing about books and their collectors through many volumes now; Dave's and my favorite is A GENTLE MADNESS, which wanders irresistibly through the shelves and lives of bibliophiles. Basbanes is currently working on a history of the Yale University Press, and simultaneously on a book on paper -- the distinguisher between the Kindle's electronic presentation, and the objects we my still love to trundle along with us on vacations, into armchairs, and at last to bed for the subtle relaxation of reading before sleep. Even Basbanes and his work cross over into the newly globalized electronic world, though, and here's a marvelous example: There's a long, delicious article on him this month in THE HINDU, the online edition of India's national newspaper. It's in English, and well written: http://www.hindu.com/lr/2008/08/03/stories/2008080350390800.htm. Do take a look! Kingdom Books continues to add Basbanes material, which can be easily seen by following our web-site link to our listings at ABEBooks.com and placing "Basbanes" in the author slot. Even more fun: use the web site link here, click on "Browse & Buy Books" to get the ABE portal, and place "fine press" in the keywords slot. Poets and poetry lovers will converge on Jerry Johnson’s bucolic home and farm in East Albany, in the heart of the Northeast Kingdom, on Saturday, August 23, for the League of Vermont Writers’ annual summer picnic. This year’s picnic will be a poetry fest featuring readings and poetry writing sessions led by noted League poets and guests. The League of Vermont Writers (LVW), Vermont’s oldest state-wide writers’ organization, summer picnic will begin at 11:30 a.m. and will include a Bring Your Own picnic and selected readings by featured poets including Ed Barna, Ann Day, Michelle Demers, Victor Densmore, Kathleen McKinley Harris, Jerry Johnson, Margret Richard, Julia Shipley and Nancy Means Wright. Following the poetry readings there will be an opportunity for participants to read a poem/share a poem in small groups and then try their hand at writing poetry in poet-led sessions. More active fun follows the afternoon of verse with an opportunity for tennis, photos and socializing. Jerry Johnson, the host of the picnic, is enthusiastic about the event: “The summer poetry picnic is equal parts socializing and working in a beautiful setting with a truly diverse group of talented poets and writers." The LVW Summer Picnic and Poetry Fest is open to everyone. You don’t have to write poetry to participate. You can bring a favorite poem or two to share. The picnic is BYO (bring your own) food and beverages. Participants should pack a picnic lunch and drinks, food for the grill, a lawn chair or blanket, a favorite poem or two and pen and paper. Also, remember your tennis gear if you want to hit a few tennis balls on Jerry’s clay court. To register for the picnic, or learn more about the event, visit the League web site: www.leaguevtwriters.org. The cost is $10 for League members and $12 for non-members. You can also register by mailing your check payable to LVW to: LVW Registrar c/o Helen Gow, PO Box 142, Warren, VT 05674. Be sure to include your name, mailing address, phone number and email address. Rachel Hadas, whose 12 books of poetry are deeply rooted in her classics background and her years as a young woman in Greece, took the podium at the Frost Place last week to offer a close reading of several James Merrill poems, weaving into her talk both personal insight and biographical detail. "The Broken Home" is Merrill's sonnet sequence that refers to the divorce of his parents when he was ten -- a collapse that created a wounded child in the midst of great financial wealth. “There’s always a lot of autobiography in all of Merrill’s poems,” Hadas asserted. She went into the poem with energy and delight, pointing out the “maxim” nature cropping up in it, and the puns around banking language. In cloud backs well above Wall Street and wife. But the race was run below, and the point was to win. He could afford it. He was "in his prime." “One of the many things that poetry can do that prose can’t is this wonderful elliptical leaping” – from the clock of Merrill's father’s life, to the clock of history – then combining suffragette history with the marriage on the rocks. “Within the broken home, which is of course an image by itself, there are pieces that are broken,” Hadas noted. 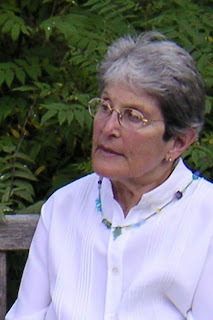 She updated the younger listeners by reminding them that in Merrill's youth gay people couldn’t have children, by either adoption or insemination, so that Merrill had a period of grief around the issue – and his work also includes much punning from “son and heir” to “sun and air” within the metaphor of a garden. “Merrill clearly was a formalist technician,” Hadas continued. She noted that among the New Formalists (among whom she is usually numbered), formalism has gotten a bad rap for its “Fabergé egg” precision, but she demonstrated that Merrill was clearly relaxed about form, and "the bad rap isn’t correct." “Days of 1964” was her next offering, a love poem; when Merrill writes love poetry he does so in the second person, something that fiction doesn’t do very well, Hadas remarked; but it's a long tradition in love poetry, including that of Sappho. For Hadas, a narrative of lovers telling each other stories gives it "a Scheherazade feeling." Sliding again toward biography, she pointed out "a feeling of Plato’s symposium" as Merrill was living in Greece and had grown up and was having a good time in the period he's addressing ("I had gone so long without loving, / I hardly knew what I was thinking. // Where I hid my face, your touch, quick, merciful, / Blindfolded me. A god breathed from my lips. / If that was illusion, I wanted it to last long"). Hadas is also the perfect expert to address the way that the title of this poem echoes Cavafy’s poems that all began with “Days of” and were love poems in an urban setting -- her critical work includes a volume on Merrill and Cavafy. Hadas: the dogs [in this poem] can be a topic easily sentimentalized, and M skirts it. Hadas: I think I would say to poets, pay a lot of attention and do a lot of eavesdropping, which is very easy in this age of cell phones. An hour and a half of this exploration made for quite a morning up on the mountain; I heard one listener say afterward, "I'd never really read Merrill's poems before, and now I'm so excited about them!" Before I headed to the Vermont Studio Center last week to hear Ed Ochester read his work, I mentioned his name to a couple of poets hanging around in Vermont -- and they nodded and said "Pitt Poetry Series." Ochester has been the editor of the series since 1979, so that's no surprise. But with 15 books of his own poetry, this gentle and often humorous voice should be better known. "Can you type?" Jake said. "Maybe ten words a minute." Ochester praises Jake, who "paid me for nothing" and who taught him the great secret of living: "be nice." It's a lesson Ochester seems to have braided with his narratives, so that even when his tales wander into underground darkness -- as in "The Canaries in Uncle Alfred's Basement" -- there are often glitters of real gold in the shadows. I know this sounds almost "too nice" in an era of grief and terror. Yet it's part of what fuels the faith we need to get up each morning. Ochester's "poems selected and new," UNRECONSTRUCTED (Autumn House, 2007), gives a sampling of four of his earlier collections as well as 21 new pieces. Among them are marvelous tongue-in-cheek moments, as in "Cooking in Key West" -- "When you're dead, you'll forget everything" -- and in "March of the Penguins," a film that was praised by the Right Wing as an example of monogamy and intelligent design (can you believe?! ); Ochester ends his paean, "and as for / "intelligent design." even Britney Spears / wouldn't drop her eggs / at 70 below." UNRECONSTRUCTED also offers a "thank you" poem to David Lehman, building on one of Lehman's less printable insights about the way the phrase "thank you" is used as a brush-off or insult. It's great fun to read this one, especially aloud. Another new one, "Fred Astaire," has already been anthologized in Best Poems 2007. By the end of the reading, I knew that Ochester's acquaintanceship with his father's generation had given him images to paint tenderly; knew that he's willing to portray his father and their relationship (he said of his engrossing narrative "Dreaming of My Father," "It's kind of an obligatory poem that a lot of people have, I guess"); and knew that he wasn't interested, at the end of the reading, in taking questions or discussing poetics. Write it, read it, and let people hold their own versions as they've received the words; that seemed to sum things up. And this acceptance of a straightforward relationship between the page and the reader/listener may be part of why Ed Ochester is one of the most appreciated editors of poetry today. Poet James Hoch will be reading on Thursday, August 14 at 4:00 pm in the Wren Room in Sanborn House at Dartmouth College. Hoch is the 2008 Resident Poet at The Frost Place in Franconia, NH. His first book of poetry, A Parade of Hands, was published in 2003 by Silverfish Review Press and won the Gerald Cable Award. In 2007 his second book, Miscreants, was published by W.W. Norton. His poems have appeared in numerous publications including the Kenyon Review and Slate. 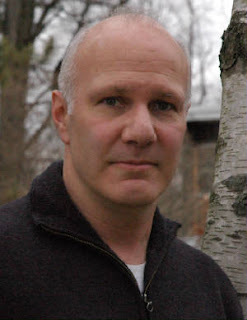 Hoch lives in Grandview, NY and teaches at Ramapo College of New Jersey. This reading is free and open to the public. There will be a small reception to follow in the Poetry Room. The second chance this month to hear Hoch read will be Wednesday August 27 at 7:30 p.m. at the St. Johnsbury Athenaeum (www.stjathenaeum.org), where he'll be joined by Frost Place director Jim Schley, also reading poetry (Schley's 2008 collection is As When, In Season). The reading is free, open to the public, and accessible. It's a huge savings in travel costs for those of us in Northern New England to be able to get to Hoch's readings this summer, rather than having to trek to New Jersey and New York. Based on his July presentation, this energetic, edgy, and clearly narrative poet is well worth the journey, though. 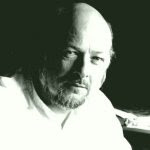 John Harvey will be the international guest of honor at Bouchercon this October -- reason enough to get acquainted with his work. He's best known for his Charlie Resnick series of crime novels, and recently began the Frank Elder series, with FLESH & BLOOD, which immediately won for him the British Crime Writers' Association (CWA) Silver Dagger Award. I picked up the sequel, the second in this dark series: ASH & BONE. A clear-eyed look at the consequences of buried guilt, this moody and often intense police procedural also portrays class and location as if they were characters themselves. Other farmers pastured their cattle on the fields, paying dues. Stray walkers aside, Elder scarcely saw a soul from one week's end to the next. It suited him to a tee. Three years now since his marriage to Joanne had imploded and he had retired from the Nottinghamshire Force, off with his tail between his legs, almost as far west as it was possible to go. More than a year since his daughter Katherine had been abducted by Adam Keach. Abducted, raped, and almost killed. Katherine, sixteen. What happened to her, Frank, it's your fault. You nearly killed her. You. Not him. Because you had to get involved, you couldn't let things be. You always knew better than anybody else, that's why. Of course, he had dreams. But none so bad as Katherine's. Harvey has been relentlessly productive, leaving a ten-year career as a teacher to turn to both writing and music. Like his American counterpart John Lescroart, he weaves jazz through both his work life and his crime novels, plays in a band, even publishes music. He taught English and Drama in secondary schools for over ten years, stopping in 1975. Since that time, he has made his living primarily with his writing. He has written over 90 novels, for both adults and young adults. He has also been involved in writing poetry, television and radio scripts. From 1977 until 1999, John ran Slow Dancer Press, and edited the Slow Dancer magazine until 1993. Slow Dancer Press continues to publish poetry and fiction, with a focus on crime fiction, short stories and writing dealing with jazz and blues. He has been published under a variety of pseudonyms, including James Mann, Terry Lennox, John J. McLaglen, William S. Brady, J.D. Sandon, L.J. Coburn, J.B. Dancer, William M. James, Thom Ryder, Jon Barton and Jon Hart. From 1980 until 1986, he taught Film and Literature at the University of Notthingham, part-time. He acted as a regular tutor for residential writing courses run by the Arvon Foundation, and was on the teaching faculty of the Squaw Valley Community of Writers Fiction Workshop (Northern California). His work has won numerous awards, including the Sherlock Award for Best British Detective (1999) for Last Rites, Grand Prix du Romain Noir Etranger du Cognace (2000) for Lumière Froide (Cold Light). Harvey isn't done with the Charlie Resnick series -- and there's another Frank Elder volume soon to come, also. It could be a full-time job to keep up with this author. Hmm, sounds like a good assignment, come to think of it. 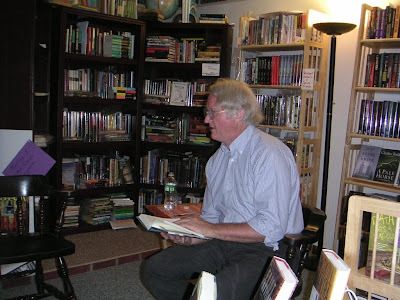 When author Eliot Pattison arrived here at Kingdom Books on Sunday evening, he had a quiet glow of satisfaction that he soon explained -- Thursday evening he'd completed his new (sixth) Inspector Shan novel, of which he'll only hint that one theme involved is climbing Mt. Everest. That's an exciting bit to hold onto. Pattison's first novel in this series was SKULL MANTRA, for which he won a well-served Edgar Award. He describes each of his books as having such a focus: for BEAUTIFUL GHOSTS it's art thefts, for WATER TOUCHING STONE it's reincarnations, for BONE MOUNTAIN it's exploitation of minerals, and for his most recent published one, PRAYER OF THE DRAGON, it's parallels with American Indian culture. While here, he read from the section where Shan begins to get acquainted with a Navaho whose unlikely arrival in Chinese-occupied Tibet has confused all the factions circling around Shan. "I always had a great interest in Eastern religions," Pattison explained, as he told the story of how he began the series. He studied those religions at Bloomington University, where he was especially drawn toward Tibetan Buddhism (which he doesn't practice -- he has a mixed American Christian background). "In a lot of ways it's not a religion, it's a phenomenon," he mused. After a few years of exloring and "drifting," Pattison entered law school; his legal career turned out to be a springboard into international travel. Soon he was visiting China, including "the lands of traditional Tibet." He began to seek out Tibetan temples, which were all over China at the time (the 1980s), a residue of the days when Chinese emperors respected the Tibetans and had lamas as members of their courts. Touring today's China and Chinese-occupied Tibet, Pattison became increasingly disturbed at what was happening there. He'd always been a writer -- of book reviews, and of two legal books -- and had always wanted to write a mystery. One day he realized he could combine that desire with his longing to talk about what the Chinese were doing in Tibet. He emphasized that he's never exaggerated any of what the Chinese are doing -- and now that he's written so much about it, he can't go back to visit Tibetans, as his very presence would mean they'd be imprisoned by the occupying force. The Tibetan situation, he said, "is something we could fix if we really want to. We can do something about it if the governments would wake up!" He added, "What the Chinese have done is one of the great crimes of civilization -- period." At the end of 2007, Pattison's second series, set in Colonial American and reaching into Native American spirituality as well as his usual crime solving, was published and shocked the readers of his Shan series by how different it is. And yet this ardent student of 18th-century America points out, "If you've read BONE RATTLER, there are an awful lot of the same themes." Its protagonist, like Shan's Tibetan friends, is an exile from a traditional society -- the Gaelic Scots -- whose home has been destroyed by an occupying force (the English). "I have a lot of Scottish blood," Pattison explained, "and believe me, there's an awful lot of spirituality woven into the Scots. ... Broadly, there's this theme [in BONE RATTLER] of natural justice, and people ignored by governments, having to make up their own culture." A fairly private person, Pattison gave few other details of his own life, other than that he lives in Pennsylvania with his family, but feels at home here in Waterford, Vermont, because it happens to be where he married his wife! He did, however, share some of his own favorite reads: Martin Cruz Smith (especially GORKY PARK), John Le Carré, and a lot of historic fiction, especially Dorothy Dunnett. Dave and I feel very much honored by the visit from Eliot Pattison; we had a shop full of readers who expressed much the same. Check in again next year -- maybe the Pattison travels will again lead through the Green Mountains of Vermont. The best-laid plans ... you know the rest. Here's a photo that Dave captured of Edgar Award-winning author Eliot Pattison as he read aloud here yesterday evening from PRAYER OF THE DRAGON, his fifth book in the Inspector Shan series set in Chinese occupied Tibet. A generous and well-read crowd gathered to meet the author and ask questions. I'll write it all up tomorrow -- today got "hijacked" by other time requests. For those hungry for news of book six, Pattison revealed he'd written the last page on Thursday night. And he was headed for a quiet place in Maine to begin the second book in his BONE RATTLER sequence. Hurrah! Today was the finale of the Festival and Conference on Poetry -- the 31st one at the Frost Place in Franconia, NH. Here's a snippet from Cornelius Eady's craft lecture this morning. "You get your influences -- they feed you, they nourish you, they don't turn to demons if you're lucky -- but at a certain point, it's you behind it all." Strategic planning/board meeting for the Frost Place, all day Sunday. Send good thoughts our way as we plan for a sustained future for this heart-deep set of programs and the home and land where Robert Frost and his family lived at the most significant turning point of his career. I'll be back to reviews by Monday. Voigt pointed to the couplet structure of the poem and mentioned that each is a stanza (the word derives from the Italian for "little room") and that the white space of the stanza break insists that the reader pause, allowing a question to register of "why is this space here?" She noted that the stanza "is another opportunity that we poets have that the poor fiction writers do not." When one teacher asked her about a pair of the poem's questions crammed into one couplet, with one of the questions broken off by the stanza break, Voigt explained, "What I'm trying to do is to rearrange that, to make you hear something else." monstrous in its secret appetites, its habits? Comparing the work to prose, where the effort of reading is for "discursive information" and the form is promptly forgotten, as long as it contains subject and verb, Voigt said, "What poetry does is slow your brain down so you won't do that as quickly." It creates additional information that is not just discursive, but emotive, in response to the words being read. In "The Hive," the emotional moment of the poem is yet to come, fastened upon in a hospital waiting room. I won't spoil the suspense by giving the rest of the poem here -- it's worth reading in its entirety. "Structure is the order in which information is released to the reader," she emphasized, drawing the teachers into exploring her sequence of words in the final line of the poem, "back to the humming, hungry, constricted hive." And for the buildup to that in the poem, "If it doesn't move, if it doesn't change, if it doesn't develop and change, it's not a poem. That's what we mean by structure." For many in the room, this level of analysis was clearly new. Voigt's teaching style insists on participation and on the "students" taking risks in answering her questions, though, and after she'd worked with the group for 45 minutes on "The Hive," some were grappling successfully with the concepts she introduced. They adjusted seats quickly to be able to look into shared copies of her book as she gave them a quick introduction to "Rubato," a poem written as a sequence: "Sequence is something that I've gotten into over the years; it gives you a chance to come at something from seven different directions." I'll be watching eagerly for Voigt's new work on syntax, to add to her earlier exploration of the underpinnings of poetry in THE FLEXIBLE LYRIC. Meanwhile, it's time for another, more informed reading of her National Book Award and National Book Critics Circle award finalist, THE MESSENGER. Sorry to be fairly quiet this week -- it's the Festival and Conference on Poetry up at the Frost Place, and I've been attending a good share of the free public evening readings (www.frostplace.org). "Work" has to fit in around those. But here's a quick little insight into what it was like to Maxine Kumin as she stepped into the U.S. Poet Laureate-ship -- actually, then, the Consultant in Poetry to the Library of Congress -- in 1981. She read Monday night at the Frost Place, first with a semi-autobiographical "golden oldie" poem called "The Hermit Wakes to Bird Sounds" (she said her hermit poems spoke from a male persona "because I didn't think the world was ready for a female hermit"), then moved into some political work -- what she calls her "torture poems" -- from her newest collection, STILL TO MOW. and He takes us all inside. "And that's quite an early poem," she commented. "It sort of surprises me. It's true I've been writing poems for an awfully long time, so that they can now surprise me." She went on to read the very entertaining "Seven Caveats in May" -- her bear poem -- then delighted listeners with "The Sunday Phone Call," in which she finds her (dead) father on the other end of the phone. After reading "Jack" (title poem to her previous collection, which is rich with horses and dogs), and "Mulching," she offered her own Robert Frost poem, "The Final Poem." And then she gave us the poem for which she says she's been in equal measure praised and damned, the one from a tag line in The New Yorker: "Please Pay Attention As the Ethics Have Changed." There were more to come, and she brought the crowd to sustained applause. I was just thinking: Kumin became Consultant in Poetry some twenty-seven years ago. So it's not an end-of-career flag, a reward for having hit the peak -- rather, it can be a middle point, from which there's a lot of good road in front of you. Or, as Kumin quoted John Gardner for the epigraph of her book: "When you look back there's lots of bales in the field, but ahead it's all still to mow." It's still a good description for what she'd doing with her work.